Empowered Sustenance encompasses the facets of wellness that have impacted my own life. I consider the pillars of wellness to be (in no particular order) nutrition, movement, emotional balance, spirituality, a non-toxic lifestyle, and sleep. In the past year, I’ve delved more deeply into the topic of sleep. As someone who has struggled with insomnia until recently, I’m passionate about sharing holistic resources for deep sleep. This post is generously sponsored by Re-Timer, a small company through which I’ve learned a ton about holistic insomnia recovery. Like always, it is my strict policy to only share content that reflects my genuine experience and I only recommend products from companies that meet my high standards for integrity. What’s the problem with melatonin supplements? You know that melatonin is a hormone associated with sleep. It follows a circadian rhythm, with levels peaking at night and dropping in the morning. Melatonin is commonly thought of as a sleep initiator. While melatonin does create a sense of drowsiness, the body does not produce this hormone to initiate sleep. Instead, it helps regulate the body’s other circadian rhythms. There are three primary issues with melatonin supplements, as I’ve discussed in my post 3 Reasons to Avoid Melatonin. First, melatonin is hormone therapy, and taking any hormone into the body should be approached with reservation and an experienced practitioner. Second, melatonin is not a sleep hormone. While it correlates with sleep cycles, melatonin is a regulator of many aspects of our “body clock” rather than a sleep potion. Third, melatonin supplementation carries side effects including next-day drowsiness, nausea, and nightmares. Melatonin regulates our circadian rhythms, which in turn affect our sleep cycles. Insomnia often occurs when our circadian rhythms don’t align with our environment. Carefully manipulating melatonin levels during certain times of the day can rebalance those circadian rhythms so that we fall into a normal sleeping pattern. 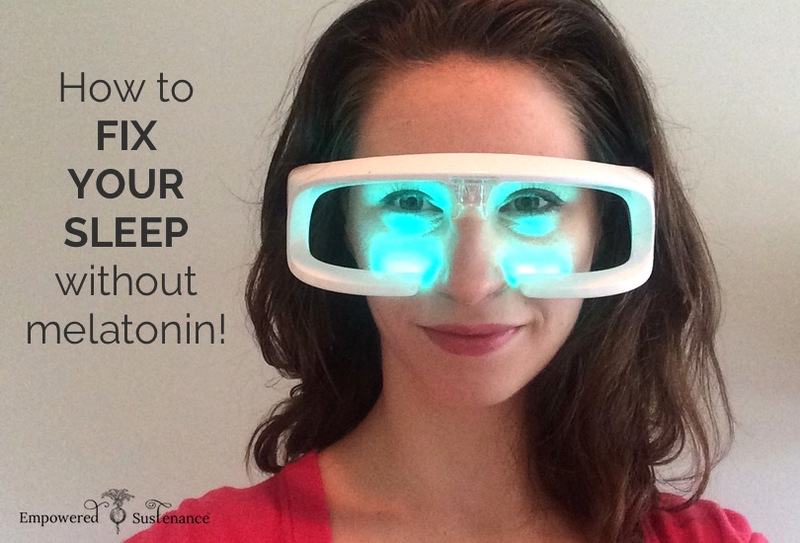 Melatonin supplementation isn’t the ideal option, but light therapy is the safer and more effective way to manipulate melatonin levels. How does light affect melatonin production? The pineal gland produces and secretes melatonin, according to a rhythm determined by the ‘circadian clock’ portion of the brain called the suprachiasmatic nuclei. The suprachiasmatic nuclei is controlled by light input from the eyes. Light tells the nuclei to inhibit melatonin production (source). The most convenient and effective form of light therapy that I’ve found is Re-Timer, which are glasses that have a melatonin-suppressing green-blue light. 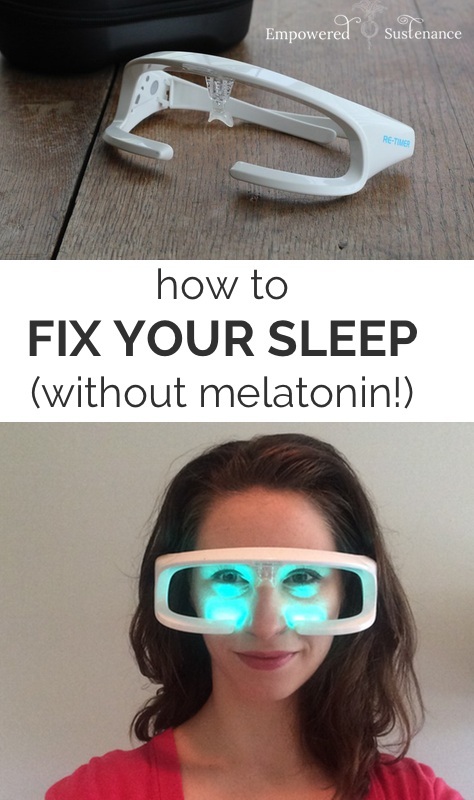 Interestingly, green-blue light has been shown to have the most melatonin-suppressing effects . Re-Timer is a multi-use form of light therapy and is not limited to remedying jet lag. Re-Timer can re-set your body clock to address insomnia, particularly Early Morning Awakening Insomnia (inability to fall back asleep after waking too early) and Sleep Onset Insomnia (laying awake when you want to fall asleep). In the section below, I discuss how to use Re-Timer for this purpose. The process you’ll use to address insomnia with Re-Timer alters the time your body naturally wakes up. I’ve had great success with this, which I discuss below. I was able to train my body to automatically wake up earlier without feeling drowsy. Re-Timer can be used for Seasonal Affective Disorder (SAD). Light therapy is the most common treatment for SAD. Re-Timer uses green-blue light, which boasts higher efficacy for treating SAD than the more commonly used white light. Using Re-Timer when you wake up can be an easy remedy for SAD. It can help your body adapt to shift work. Research shows that shift work is correlated to detrimental health effects including higher rates of cardiovascular disease and cancer. Depending on one’s shift work cycle, Re-Timer can be used during the day to help balance the body’s circadian rhythms. It’s compact and travel-friendly, perfect for remedying jet lag. Re-Timer comes in a sturdy protective case, ideal for travel. You can reset your body clock when you arrive and leave your travel destination. I’m not a frequently traveler, but I will definitely use Re-Timer for future trips, since it has worked so well for altering my body clock at home. It beats a light box. Perhaps you’ve heard of “happy lamps” or “happy lights” as treatment for Seasonal Affective Disorder. Light boxes have also been recommended as light therapy to re-set circadian rhythms. I bought a light box years ago and used it probably a total of five times. Why? It was boring and confining sitting in front of it each morning. With Re-Timer, I can wear it while I prepare and eat my breakfast in the morning. I’ve used my Re-Timer for two months, and was astounded by how immediately my body clock shifted. My primary goal for Re-Timer was adjusting my body to wake up earlier. I’m usually a morning person, but dark Seattle winter mornings make it more difficult for me to get out of bed. The Re-Timer e-book outlines a plan to re-set your body clock to wake earlier, and their website also offers a convenient Sleep Calculator here. I followed the directions determined by the sleep calculator, which involved using my Re-Timer for 30 minutes earlier each day. For example, 8:30 one day, then 8:00 the next day, etc. I found that, within 3 days, my body transitioned so quickly that I was awake before my alarm went off. I woke with no sense of drowsiness, despite it being pitch black outside. For the following week, I chose to continue using my Re-Timer for 30 minutes each day, upon waking. I felt like my body clock was set, but I noticed a significant difference in my alertness each morning after wearing the Re-Timer. Now, a month later, I use my Re-Timer at least a few times a week, in the mornings upon waking. I still use my alarm on mornings when I need the back-up, but with regular Re-Timer use I wake naturally at the same time each morning. If you struggle with falling asleep at night and feel drowsy in the morning, this is the pattern you want to follow. If, on the contrary, you wake up too early in the morning, you will want to wear your Re-Timer before bed, in a similar gradual process. For more details on the schedule, use the Re-Timer Sleep Calculator or download the Re-Timer sleep e-book. Start Re-Timing your body clock today! 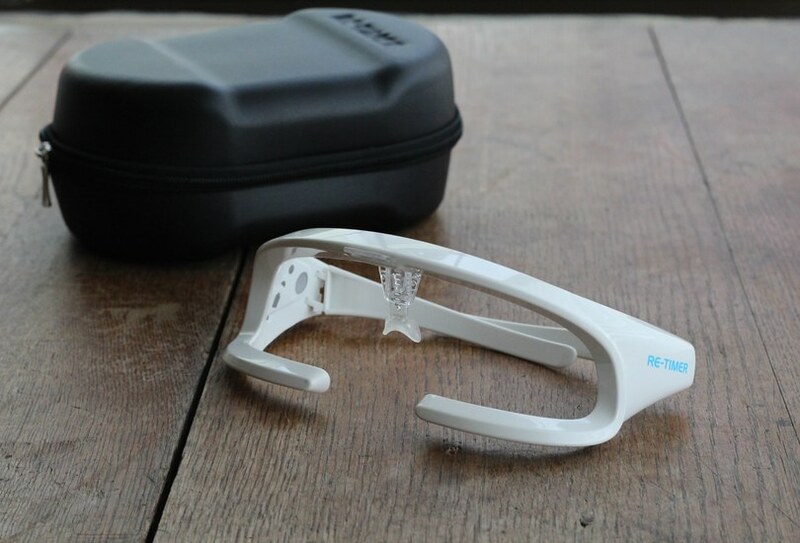 Add Re-Timer glasses to your shopping cart at Re-Timer.com. Use coupon Empowered30 at checkout to save $30. Use your Re-Timers for just 30 minutes a day to balance your body clock. I wish you happy and healthy sleep! I suffer from SAD and struggle waking up in the mornings so I understand how suppressing my melatonin production would help me to feel more awake. I just don’t understand how that would help someone who has insomnia to sleep at night. Would you mind explaining to me how that works? My brother has HIV and has always struggling in falling sleep but since he started the antiretroviral treatment he has been much worst, not being able to fall asleep then having nightmares. Then he cannot wake up in the morning. I wonder if the glasses could help him. This looks amazing, Lauren. And I LOVE the pics of you wearing the re-timer! Thanks for the great information! Hi, I’m a little confused about this. I need to sleep more to get well. I usually get to bed early and fall asleep around 10:30. But I wake up at 5. I would like to sleep one more hour. The calculators advise to me is to fall asleep at 11:30 instead. Which seem rather stupid to me. It looks like their suggested number of hours of sleep is 7. I calculated that I wanted to wake up at 7 instead of 5. I go to bed at 10 as “they” say sleep before midnight is worth twice the sleep after midnight. The calculator told me to go to bed at midnight! That is ridiculous!! This looks very interesting. It’s expensive though, for something that may or may not work. I wonder if this might fix my sleeping disorder? That’s what I would like to know as well! I wake up multiple times started around 1:30 in the morning. Sometimes it takes over an hour to fall back to sleep, only to wake in another hour. I also suffer from fibromyalgia luckily I don’t care about anything and will stop at nothing to get a good nights sleep. It doesn’t matter how much pain I’m feeling when its time for sleep I’m gone. When I wake up though its back to living in hell. I started following a strict vegan diet about 4 months ago and have seen incredible improvements in my fibro symptoms. Try eliminating certain things out of your diet for starters and see how you feel after each week. Hope you feel better Kathleen, I know what its like! If you are a true Insomnia sufferer you will understand my question. These are expensive but when you deal with Insomnia you will do what ever it takes and trust anyone who is telling you something works because if they have truly suffered with Insomnia they understand your pain and suffering. Do you really feel these will work? The reviews on Amazon are half and half some tell us not to waist our money because they don’t work and the company is awful to work with a refund and then you have one or two people saying they think the glasses have helped them. All this to say is I will invest in this if you truly feel they help. Sorry but i dont agree. Insomniac since childhood and the only downside to melatonin is finding it without extra fillers. It DOES make me sleepy and it DOES help me (most nights) to go back to sleep after waking from sounds or toilet needs. It takes some adjusting, and over time ive learned to use 4 mg. I also have added 6 drops lavendar EO before bed and magnesium citrate. Since implementing this combo nightly, I have had GREAT success sleeping 7-9 hours! Hi Lauren, thanks for your post and happy New Year! I was reading some older posts and read the one about the phillips warm light alarm clock. How do these 2 different therapies compare to each other? I struggle to wake up in the morning despite going to bed at 10pm. It takes me hours (literally) to wake up and I spend about 10 hours in bed. Which one of these 2 deviced would be more suitable in your opinion? How does this work if you go to sleep easily but then wake at 1 or 2 in the morning for a couple of hours and then are drowsy again too early the nest night?